With Bergmann Orthotic Lab, you are not only getting an orthotic lab with over 75 years of experience in manufacturing foot orthotics, but you are getting the experience of Dr. John Bergmann as an extension of the orthotic treatment for your patients. Dr. Bergmann has been fabricating orthotics for nearly 60 years—starting at age 14—and this experience is built into every orthotic Bergmann Orthotic Lab fabricates. 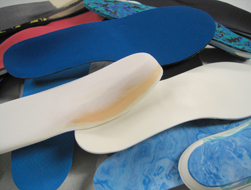 Dr. Bergmann and his team include his son John at the lab as a pedorthist designing orthotics. Together they remain on the cutting edge of new product development, including experimentation with new materials as well as alternative approaches to foot orthotic biomechanics. Biomechanical and orthotic consultation is readily available from Dr. Bergmann. He draws from his experience in his specialized practice limited to orthotic treatment of biomechanical conditions of the lower extremity. Dr. Bergmann's patients are high school students, college students, and professional athletes as well as general orthotic patients from children to the elderly. Many are referred to his clinic from other podiatrists, athletic trainers, sports teams, and medical specialties from around the world. He has the experience you need for those difficult orthotic cases. You can schedule on-site appointments for your patients or can consult with Dr. Bergmann by phone.